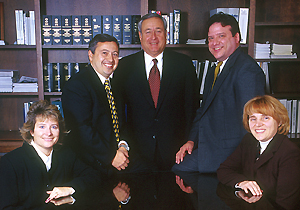 SIMIONE MACCA & LARROW (SM&L) LLP is a dynamic and growing organization with roots tracing back to 1973, and with offices today in Hartford and New Haven Counties. We are a licensed firm of Certified Public Accountants which serves a diverse client base with accounting, auditing, tax and management advisory services. Each of our principals is a member of the American Institute of Certified Public Accountants and the Connecticut Society of Certified Public Accountants. At SM&L, we take pride in the reputation we've developed for integrity, professional excellence and commitment to service. In addition to our growing clientele throughout Connecticut, SM&L provides a full range of services to clients in Massachusettss, Rhode Island, New York, California and Florida; we also provide consulting services on a national basis. Our service concept requires significant "on-site" participation by management personnel responsible for each engagement. This allows us to discuss various key aspects of the engagement with management in a timely and accurate manner and to provide the supervision necessary for competent and cost-effective completion of the engagement. SM&L believes continuity of engagement staff is essential for providing cost-effective service.